Paper size: 64.8 x 50 cm. / 25.5 x 19.7 in. Image size: 38.8 x 29.5 cm. / 19.3 x 11.5 in. 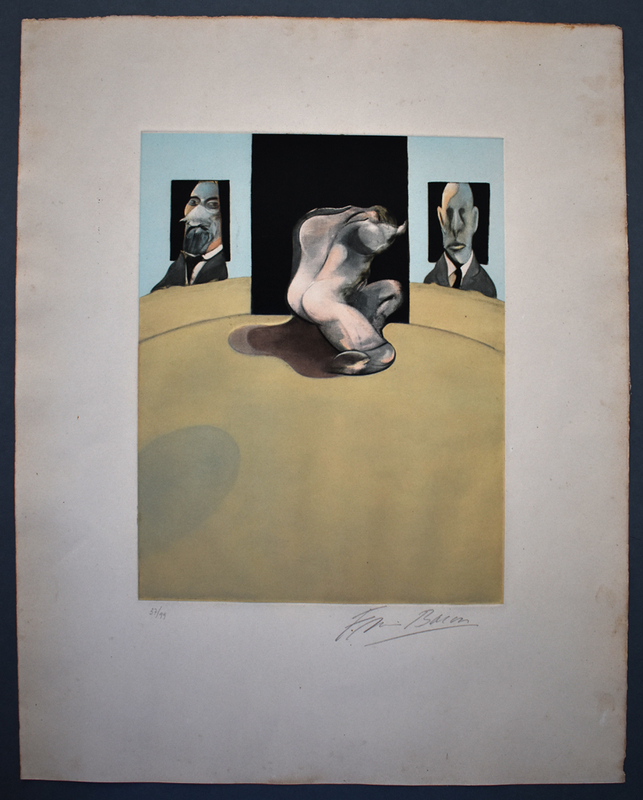 Additional Information: This etching and aquatint in colours is hand signed in pencil by the artist “Francis Bacon” in the lower right margin. It is also hand numbered in pencil from the edition of 99, in the lower left margin. The work was printed in a limited edition of 99 signed and numbered impressions with an additional 15 Hors Commerce [out of trade] impressions and 15 artist’s proofs. It was printed and published by Polígrafa, Barcelona in 1981. It is based on the painting of the same title. Note: Tryptic 1974-1977 is one of Bacon’s finest triptychs. It was painted by Bacon between May and June 1974 and was made in response to the tragic death of his lover George Dyer in 1971. It was the last work the artist made before a major retrospective of his work held at the Metropolitan Museum of Art in New York in 1974. The exhibition formed the culmination of this important survey of Bacon’s career from the late 1960s onwards and was immediately recognised as both a major landmark and also perhaps a turning point in Bacon’s career. 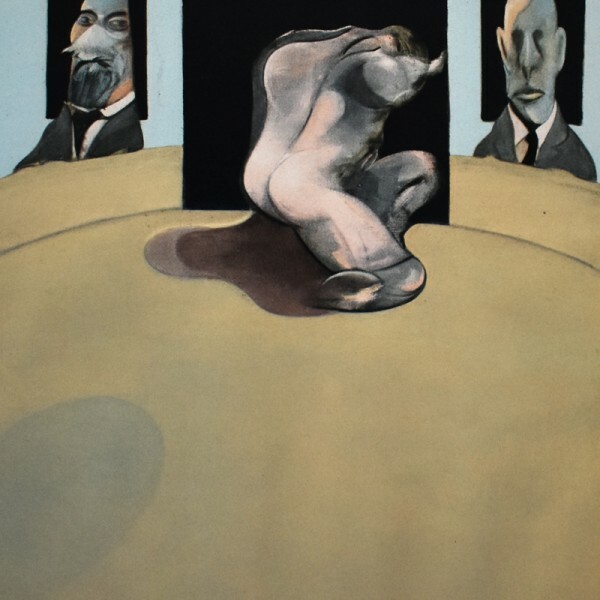 From 1971, Francis Bacon had been preoccupied with Dyer and the tragic manner of his suicide. Triptych 1974-77 also borrows several elements from the three earlier so-called ‘Black’ triptychs (In memory of George Dyer, 1971, Triptych August 1972 and Triptych May-June 1973). In each of these great three-panel paintings, the figure of Dyer is presented on the threshold of entering a dark void, either in the form of his hotel room, or silhouetted against a sequence of black rectangles. At the bottom of this central panel on a pale blue, purple and black curved continuation of this arena-like circle, there originally appeared a bizarre prone and bespectacled slug-like figure. Based on one of Edward Muybridge’s photographs Man falling prone and aiming rifle, it is an extraordinary figure, whose wide circular eyes staring the viewer with cold circumspection. 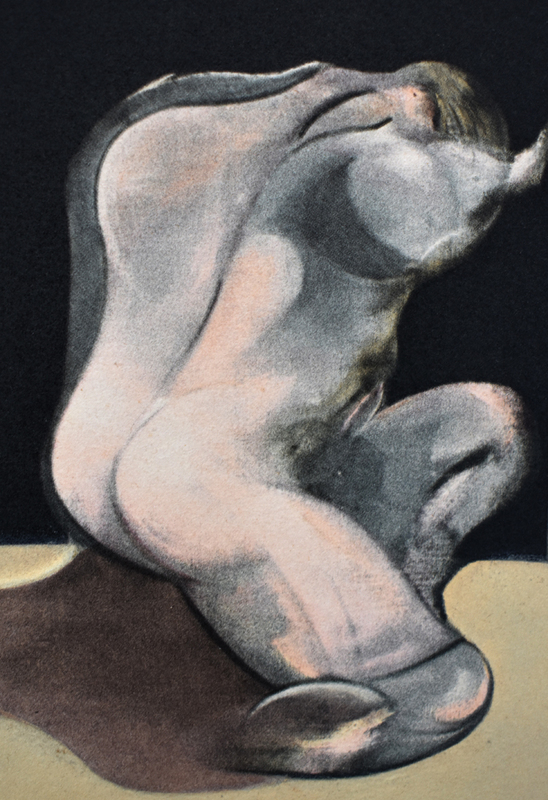 In 1977, Bacon decided that this figure interfered too much with the general homogeneity of the rest of the composition and carefully painted it out in a manner that would ensure that over time its ghost should not reappear under the surface of the painted sand. It was in this way that Triptych May-June 1974 became Triptych 1974-77. The left-hand head is based on an altered image of Raymond Poincaré as it appears in Baron von Schrenck-Notzing’s 1920 book Phenomena of Materialisation. The right-hand head derives from a distorted photograph of Sir Austen Chamberlain that appears in Amédée Ozenfant’s Foundations of Modern Art. The umbrellas are no sunny beach parasols. With their black presence in the picture, they are responsible for endowing this otherwise pleasant beach with a sense of melancholy. They also recall Bacon’s earlier and more sinister use of umbrellas to crown and conceal the figures in his 1940s paintings, Figure Study II and the terrifying Painting of 1946. The use of sea landscape reinforces the psychological atmosphere of the painting that this work comes close to the psychological Expressionism of an artist like Edvard Munch and the tortured atmosphere he managed to achieve through similar means in a painting such as Melancholy of 1891. Munch was another artist that Bacon admired, though he was always fiercely resistant to any association between himself and Expressionism. It is only the sea, which Bacon once told Michael Peppiatt could convey a ‘feeling of hope’, that lends this work any sense of optimism. Bacon was able to convey not just the extraordinary visceral vitality of life through the shock, surprise and immediacy of his paint, but also a profound sense of alienation felt by modern man than perhaps any other Twentieth Century painter. Bacon’s subject matter is, ultimately, the odyssey of human life and the strangeness and awkwardness of man’s existence. 1. Tacou, A. (2008). 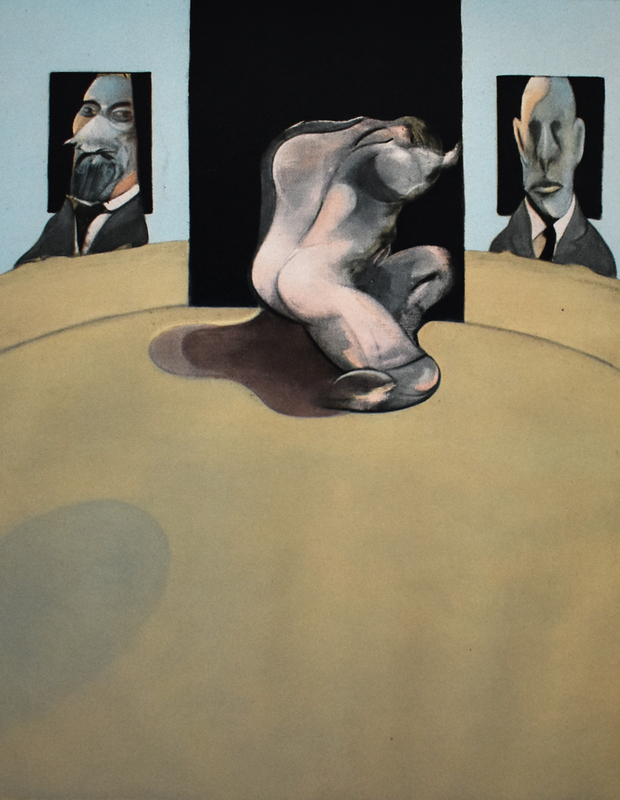 Francis Bacon: Estampes – Collection Alexandre Tacou. Paris: Bervillé Éditions. 2. Sabatier, B. (2012). Francis Bacon: Oeuvre Graphique – The Graphic Work: Catalogue Raisonné. Paris: JSC Modern Art Gallery. Condition: Good condition. Sheet with toning and pinpoint foxing across the sheet. Soft creasing in the margins and an indentation in the left margin.